Ardor, inspiration, the soul, the sublime: Such terms have long since fallen from favor among critics and artists alike. In his new collection of essays, Adam Zagajewski continues his efforts to reclaim for art not just the terms but the scanted spiritual dimension of modern human existence that they stake out. Bringing gravity and grace to his meditations on art, society, and history, Zagajewski wears his erudition lightly, with a disarming blend of modesty and humor. His topics range from autobiography (his first visit to a post-Soviet Lvov after childhood exile; his illicit readings of Nietzsche in Communist Poland); to considerations of artist friends past and present (Zbigniew Herbert, Czeslaw Milosz); to intellectual and psychological portraits of cities he has known, east and west; to a dazzling thumbnail sketch of postwar Polish poetry. Zagajewski gives an account of the place of art in the modern age that distinguishes his self-proclaimed liberal vision from the right-wing radicalism of such modernist precursors as Eliot or Yeats. 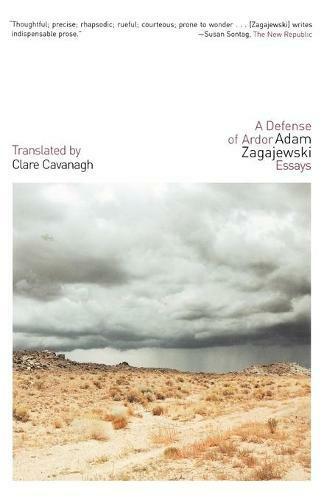 The same mixture of ardor and compassion that marks Zagajewski’s distinctive contribution to modern poetry runs throughout this eloquent, engaging collection.